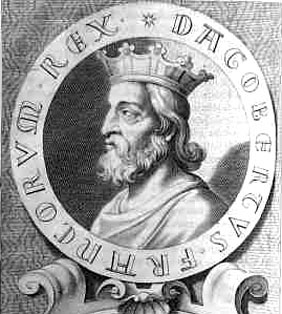 Dagobert I, king of the Franks, was the son of Clotaire II. In 623 his father established him as king of the region east of the Ardennes, and in 626 revived for him the ancient kingdom of Austrasia, minus Aquitaine and Provence. As Dagobert was yet but a child, he was placed under the authority of the mayor of the palace, Pippin, and Arnulf, bishop of Metz. At the death of Clotaire II in 629, Dagobert wished to reestablish unity in the Frankish realm, and in 629 and 630 made expeditions into Neustria and Burgundy, where he succeeded in securing the recognition of his authority. In Aquitaine he gave his brother Charibert the administration of the counties of Toulouse, Cahors, Agen, Périgueux, and Saintes; but at Charibert's death in 632 Dagobert became sole ruler of the whole of the Frankish territories south of the Loire. Under him the Merovingian monarchy attained its culminating point. He restored to the royal domain the lands that had been usurped by the great nobles and by the church; he maintained at Paris a luxurious, though, from the example he himself set, a disorderly court; he was a patron of the arts, and delighted in the exquisite craftsmanship of his treasurer, the goldsmith St. Eloi. His authority was recognized through the length and breadth of the realm. The duke of the Basques came to his court to swear fidelity, and at his villa at Clichy the chief of the Bretons of Domnoné promised obedience. He intervened in the affairs of the Visigoths of Spain and the Lombards of Italy, and was heard with deference. Indeed, as a sovereign, Dagobert was reckoned superior to the other barbarian kings. He entered into relations with the eastern empire, and swore a "perpetual peace" with the emperor Heraclius; and it is probable that the two sovereigns took common measures against the Slav and Bulgarian tribes, which ravaged in turn the Byzantine state and the German territories subject to the Franks. Dagobert protected the church and placed illustrious prelates at the head of the bishoprics -- Eloi (Eligius) at Noyon, Ouen (Audoenus) at Rouen, and Didier (Desiderius) at Cahors. His reign is also marked by the creation of numerous monasteries and by renewed missionary activity, in Flanders and among the Basques. He died on the 19th of January 639, and was buried at St. Denis. After his death the Frankish monarchy was again divided. In 634 he had been obliged to give the Austrasians a special king in the person of his eldest son Sigebert, and at the birth of a second son, Clovis, in 635, the Neustrians had immediately claimed him as king. Thus the unification of the realm, which Dagobert had reestablished with so much pains, was annulled.